Shadowrun is awesome, Hydro. You should look into that more some time. Right, so we've got our plates more or less done. Let's get this boat show on the road! Did a rough map to show where likely mountains would be placed. Right, so the order of events. We've got our map outline and plates decided upon. We also know where there are likely to be somewhat large mountain ranges. I assume we'll be able to paint in smaller ranges here and there. At this point we can also get an idea of what some of our biomes are going to look like. Are we ready to begin painting biomes? How would you like to go about terraforming areas? A grid? Just call out places? Discussion and teamwork? We have options! You need to draw the Equator, Tropic lines (ex tropic of Cancer) and polar circle lines. So we can tell where each of the 3 categories of biomes will be (polar, temperate and tropical). After they are drawn you need to draw the sea currents so we can accurately place biomes. 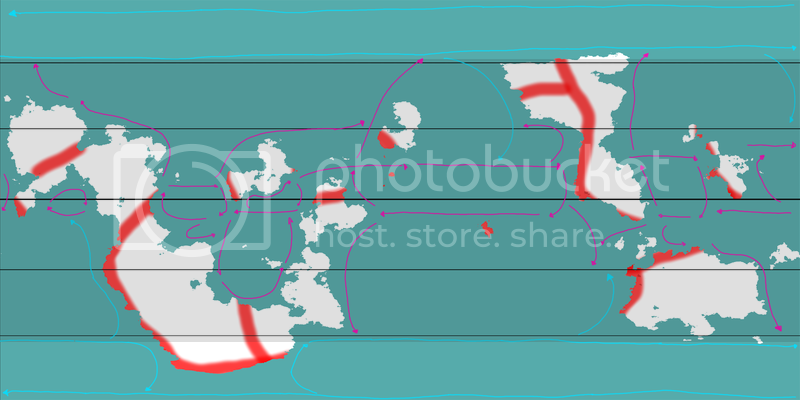 I made a quick version of hwo sea currents could work. This will help us determine where biomes should go. I like the stratification of biome types. There's a lot there, but it seems like detail that will be useful to have. As for the currents, I like it. I just don't know if my judgement on this aspect is the best to go by. So I'll wait for more input. I can create a geological profile for the planet if you guys like. I'll go though add all the elevation data on the 10k scale image. Also clean up the fault data and what not (probably make some minor changes, but should be mostly what Pat laid out). It might take me a few days, but it should be a nice presentable map when it's done. As for biomes, I'd use this as a reference. But I wouldn't start adding them until i finish the geological profile map. Also, that map will probably have to be redone. Both because the elevation map might affect things and because you've drawn the tropical and polar circles in the wrong places. They should be at the latitudes indicated in this article. Some good ideas. Keep in mind that was just a preliminary idea, not meant to necessarily be final. It also was meant to describe the time period technologically instead of politically, but it's hard to do specifically because of the reasons you outlined. Anyway, I'm definitely open to any changes to the system I came up with. Thumbs up from me. If we wanted to get really fancy with it then I'd suggest the cycles of covergeance and diveregeance should be out of sync for different parts of the world. So on one continent there might be an ascendent empire while on another there's a breakdown of organised states. Oh, also, feel free to throw out your ideas of where you guys might think old mountain ranges might be (i.e. Appalachian, Ural, etc.). Yes and yes. I think we will be able to gauge a lot of this better once we have an actual group of people milling about on the surface. But I like the idea of keeping it amorphous, rather than based on our own historical model. Ovi, I'd love to see your maps. I guess the biomes and topography will, to an extent, be pre-determined due to the fact that we're doing plates. Will we still be doing a "land phase" or a "terraforming phase"? How is that going to work? Or is that kind of out the window since we went with this "plates" model?